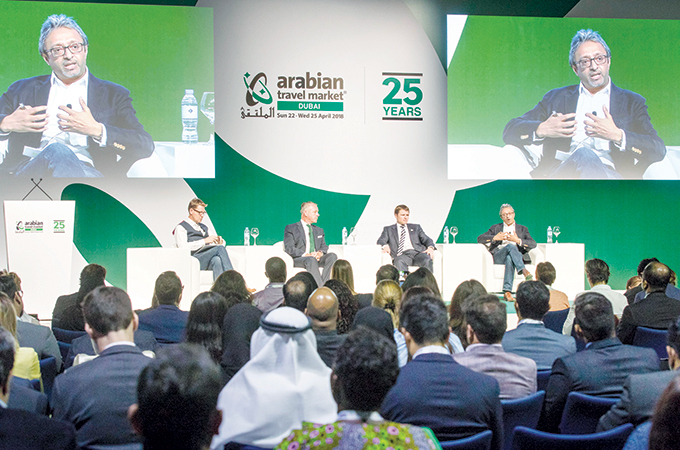 Travelling, as we know it now, is bound to change in the future, but some of the leading industry experts informed participants at the Arabian Travel Market 2018 how the winds of change are engulfing the UAE at a much rapid pace than most other places. Starting from Hyperloop connectivity between the two main Dubai airports, and a possibility of expanding it to Sharjah and Abu Dhabi airports, to extensive application of artificial intelligence (AI) and robotics at airports and hotels and going around the world without a single currency note in your pocket – these were just some of the future scenarios that were discussed at various interactive seminars during the four-day mega event. The biggest reveal came at ‘Future Travel Experiences’ where Michael Ibbitson, executive vice-president (Infrastructure and Technology), Dubai Airports, said that his organisation is studying the possibility of connecting the Dubai International Airport and the Al Maktoum International Airport by Hyperloop, thus cutting down the travel time between them to six minutes. The 62-kilometre distance between the airports currently takes 45 minutes in the best of traffic conditions. Emirates Airlines operates solely out of Dubai International Airport, but the introduction of Hyperloop will enhance customer experience and boost capacity – something that seems to be the mission statement of Ibbitson and his team. “Having both the Dubai airports as key stations on the hyperloop system is essential. At present, Emirates Airline only operates from DXB but the implementation of a hyperloop system between both airports could allow it to effectively and efficiently work from both hubs,” said Ibbitson. Ibbitson also outlined various other plans which are already work in progress with the sole aim of reducing the queues at the airport. “We are making rapid progress in eliminating the queues. We have half the length of queues – at the immigration, check-ins, etc – compared to five years ago, even though we now get 14 million visitors now,” Ibbitson added. “We have started a programme called ‘One ID’ with Dnata, which should make a customer experience at our airports much smoother. We are facing a few processing power issues with our biometrics on the move project, but the matching rate is up to 40 per cent now compared to 25 per cent four months ago. Hyperloop has the potential of changing the way people travelled in the Middle East, said Harj Dhaliwal, managing director, Middle East and India Field Operations, Virgin Hyperloop One, during the same discussion. “By cutting down the travel time to a place like Riyadh to 40 minutes, we can open up the region to the travellers. You could land in Dubai and make it a base, and do a day trip to Riyadh (expected travel time of 40 minutes) or any other neighbouring countries,” said Dhaliwal. Christoph Mueller, chief digital and innovation officer, Emirates Airline, explained how his organisation is using data to ‘hyper-personalise’ their offerings to the customers with the help of AI. “We want to make travel a very individual thing. We want to hyper-personalise the travel experience,” Mueller said. The hotel industry, which is generally slow to adapt to changes, has also realised that the times have changed. The panel at the ‘ATM and Genesys Digital Futures Summit’ and the ‘Hotel Landscape of the Future’ discussed various new developments that are taking place in the hotel industry. Olivier Harnisch, chief executive officer, Emaar Hospitality Group, spoke on how they are using AI and gathered data from the customers to reduce what he termed ‘friction point’, while Tom Skyring, design director, Wilson Associates, revealed how hotel designs are changing to reflect the needs of today’s travellers. “We try and customise our hotels as per the history of the guest. If a guest likes his shower to be 37 degrees and watches certain television channels, we will make sure the settings are the same the next time he checks in,” said Harnisch. One of the big waiting points in the reception areas, and Skyring said most hotels are moving away from large lobby spaces to smaller receptions and more social spaces. “The reception serves no use for the guests. It really is for administrative purposes of the hotel. And with advancements like digital keys and the ability to check in and check out with your phones, these space in hotels can be put to better use, like creating social spaces,” said Skyring, one of the leading hotel designers. Guido De Wilde, chief operating officer – Middle East, Marriott International, informed the gathering on a pilot project by his company involving ‘virtual assistants’ and the future use of robots. “A recent study shows that almost three billion people have the ability to travel now, most of the new ones coming from China and India. Won’t it be great if we can personalise our services by anticipating their needs?” posed Wilde. Laurent A Voivenel, senior vice-president, Operations and Development for the Middle East, Africa and India for Swiss-Belhotel International, spoke on hotel distribution in the Digital Futures Summit. “Hotel distribution has undergone a radical change over the last few years. Over the last few years we have seen disruption in our industry by a number of non-traditional players. Competition is increasing from OTAs and new players like Airbnb,” said Voivenel. All the bookings being made now, will be made with virtual cards in the next five years, said Davide Antonioli, senior sales manager, Amadeus, in his talk ‘A World Without Money’. “We are in the middle of a cashless revolution. Countries like the UAE have taken a lead in this respect having already started working towards making it a cashless economy by 2020 and we have seen India taking out almost 86 per cent of their currency notes out of circulation last year in an effort to move towards becoming cashless,” Antonioli pointed out. There was one aspect of the use of technology that every expert agreed upon – while it may lead to loss of some jobs, there will be more jobs with different profiles created as these companies push towards a new future.